The parents who are afraid of SOGI have been played. Among those holding up signs and standing in solidarity with the trustees, were students, family members, friends and allies of LGBTQ students. I wasn’t able to attend, since my current occupation had me stuck in downtown Vancouver. 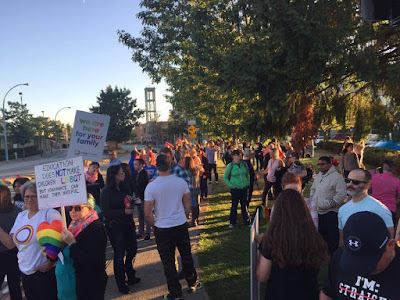 During the two weeks leading up to this peaceful rally, I was in communication with a few individuals who were responding to another group of parents. This first group had voiced strong opposition to SOGI, with a well-organized initiative that included a Facebook page and a website to raise money.